Blockchain - Is it the Silver Bullet for Longitudinal Health Records? Blockchain is getting a lot of attention for its potential to solve the data disconnect in the health system. 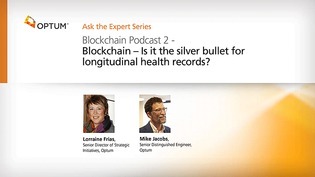 In this podcast, Lorraine Frias and Mike Jacobs examine the efficacy of blockchain in longitudinal health records (LHR). When blockchain can support this type of file sharing, it will have tremendous impact on healthcare.